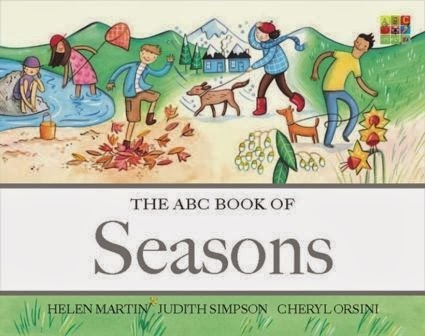 From the bestselling creators of THE ABC BOOK OF CARS, TRAINS, BOATS AND PLANES comes a glorious hardback picture book which celebrates the joys of each season. From Autumn's 'red, yellow, brown leaves' to Winter's 'sparkly cold snow', the text also introduces children to the concept of weather and its changing patterns. This book is perfect for sharing. The illustrations are bright and clear and the text is simple. There’s scope to talk about what’s happening on the page, and then opening discussions to what happens during the seasons where there readers live. There are also little adjuncts to the seasons too, such as looking at windy days in autumn, asking the general question of “What moves in the wind?’ and matching up animal mothers and babies when talking about Spring. While not every book has to 'fit in with the Australian Curriculum' this one does, so for those that are interested, here's where I think you can use it. The weather and seasons of places and the ways in which different cultural groups, including Aboriginal and Torres Strait Islander Peoples, describe them. Comparing the Aboriginal or Torres Strait Islander People’s seasonal calendar for the local area with one students are familiar with, such as the four-seasons calendar derived from Europe.